On this the fourth Sunday of the Season of Creation, we are encouraged to celebrate rivers. Today, when hundreds of thousands of Porto Ricans living along the Guajataca River are being evacuated because the force of the river may cause a dam to burst, it is difficult to contemplate gentle pastoral images of rivers gently flowing past. It is difficult to imagine the peaceful waters and let’s face it most of us come to church on a Sunday morning hoping for some sanctuary from the realities that bombard us in the media. I don’t know about you, but between the rantings of the cyber-bully who currently occupies the most powerful office in the world, and the news of the suffering caused by hurricanes and earthquakes, I would really like to be able to luxuriate for a while in the gentle images of a peaceful river. 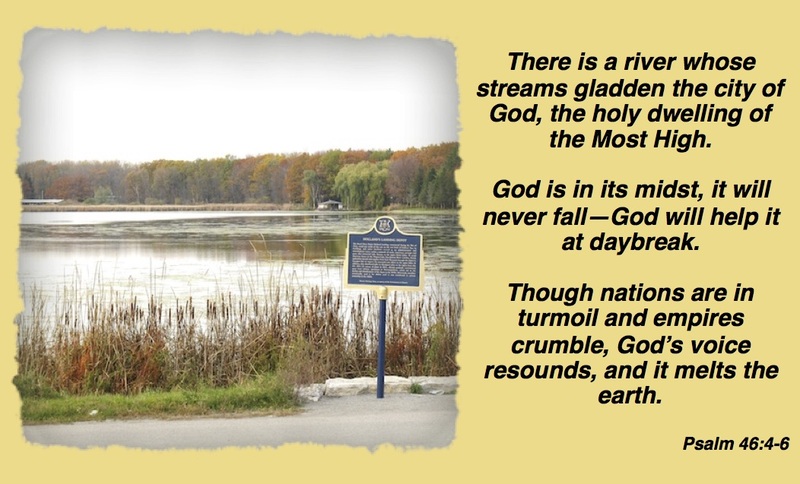 I would love to take you all on a walk down by the river-side so that we could contemplate together the image of God as a river, gently caressing us, supporting us through life. If only Jesus would refrain from teaching in parables designed to disturb us. Jesus parable about the workers in the vineyard bursts the dam of our complacency and sends us scrambling towards the shore in the vain hope that we can escape the knowledge, that while we bask aboard our luxurious pleasure-crafts, while all around us our neighbours are drowning. Sure, we could just allegorize Jesus parable and interpret it as a nice little story in which the Landowner becomes God, the workers at dawn are good Christians like you and I, while the workers who show up much later are those who convert on their deathbeds, and even though it may seem unfair, God the Landowner treats everyone the same and everyone is rewarded in some far and distant here-after because God is full of Grace. I’ve heard countless sermons that interpret Jesus’ parable as a nice little story. But the words of my preaching professor ring loudly in this preacher’s mind: “Beware of parables that become nice little stories. Parables are verbal hand-grenades and should be handled with care.” So, I hope you will forgive me if the raging waters of a river flowing violently were rivers are not supposed to be, rushes over my interpretation of Jesus parable about the kind of justice that demands so much from landowners like you and me because today as so many of our neighbours and friends are drowning, I cannot and will not allegorize this parable. You see, when Jesus’ audience heard him tell this parable, they would have immediately understood who the landowners and who the workers were. Jesus audience lived under the occupation of the Romans. Jewish Landowners in occupied Palestine would have had very few choices. Landowners could oppose the Romans and lose their land and then have to resort to becoming day labourers themselves, or they could collaborate with their Roman oppressors and participate in the abuse of their neighbours. As an occupied people, the Jews were waiting for someone to come along and save them from Caesar’s oppressive rule. They longed for a Messiah who would change their world and end their oppression. The crowds that flocked to listen to Jesus’ are looking for some sort of revelation about when and how the oppressive Roman occupations that set neighbour against neighbour was going to end. Rather than point to some far off distant salvation at the hands of an intervening God, Jesus points directly at the very crowds longing for salvation and insists that only when land-owners stop oppressing their neighbours will the long dreamed of kindom of God become a reality. Imagine for a moment that you are in the crowd. You have worked hard all your life. You have saved and invested wisely. You have a home on land you either rent or own. You and I, we are the land-owners. And each one of us, we want to pay the labourers, in whatever vineyard we are involved in, we want to pay less. Sure, an honest day’s pay for an honest day’s work is all well and good when it applies to us. But who among us is willing to pay more for our meals so that day labourers can receive salary that will feed and house their families? Let’s face it we are more than willing to shop at Walmart without caring too much about how Walmart treats its employees provided Walmart offers us a bargain. We want to pay less and we know that if we pay less, Walmart will pay less. We are all too willing to shop in dollar stores even though we know that the bargains we scoop up were in all likelihood manufactured by people working as slaves. We want to pay less for our groceries and are smart enough to know that those Mexicans working on the Marsh will be the ones to pay the price for our cheap vegetables. You know that I love my devices, my iPad is precious to me, even though I know the price paid by the labourers in China so that I could we could have our fun. We want to pay less and we also want to get more. We want our investments, and our retirement savings funds, to earn us bigger and bigger dividends. We want our property values to increase, even tough we know that those increases will make it impossible for the vast majority of our young neighbours to ever be able to become landowners. We want our governments to do more with less because we want to pay less taxes. The system is corrupt and it abuses workers and we benefit directly for that system of oppression by paying less. How dare Jesus suggest that the kindom of God will require landowners who are willing to pay more, so much more that every labourer regardless of how much they work will receive a living wage. Jesus’ audience would have expected day-labourers to be paid one denarii, because one denarii is about how much it would cost to feed and house a family in first century Palestine. And Jesus has the audacity to suggest that a landowner sould pay every labourer regardless of how long or how hard they worked one denarii simply because every labourer ought to be able to have enough? What kind of logic is this? Perhaps we are better off waiting for a Messiah to come and save us who will point to some far off distant God who will one day come and create justice and peace. The kind of justice that Jesus’ parable is proposing would have us, the landowners, pay more so that justice and peace can be enjoyed by all our neighbours. Why, if people started listening to Jesus, we’d be expected to pay more. No wonder Jesus got himself killed! Who among us is willing to stand up to an angry mob demanding that good, law abiding citizens, like us should pay less? Let them have their way with the likes of Jesus. Let those bleeding-heart radicals talk all they want about a guaranteed minimum income. There’s no way in hell we’re going to support a government that seriously proposes spending an additional 15 billion dollars so that people who don’t work hard can have a basic income that will allow them to live with dignity. Have you heard about this nonsense? This fall the Ontario government launched a pilot project in Hamilton and Lindsay, where they are paying some 4,000 people a guaranteed basic income whether they work or not. Single people in the pilot project will receive $17,000 dollars and couples will receive $24,000. It simply isn’t fair. Let them pull themselves up by their boot-straps and earn their piece of paradise just like we did. We can’t afford to have our governments acting like Jesus taught us to act. We cannot afford to be our brothers or our sisters keeper. Not if we insist on paying less. But then again, we are the landowners. We are the wealthiest Christians to ever walk the earth. Our parents and our grandparents never had it so good. We are rich beyond the wildest dreams of the vast majority of people on this planet. Indeed, we may not be the landowners, we may actually be the Roman occupiers, willing to oppress our neighbours in order to maintain the system that benefits us. Is it any wonder that biblical interpreters have described the parables of Jesus as verbal hand-grenades? If we insist on reading Jesus parables as nice little stories we might just get the kind of world we think we deserve. But if we are willing to see beyond our desires, we might be able to see the kind of kindom that Jesus saw; a world where everyone has enough. There is more than enough to go around. Do we have the courage to usher in the Kindom of God? Do we have the courage to save ourselves? Do we have the faith to be Christs to one another, to be LOVE in the world? Or are we going to cling to our small boats and stand idly by content to watch our neighbours drown? Dear friends, the good news is: there is more than enough to go around. If we are willing to pay more and receive less. Jesus calls us to be the LOVE that will save the world. Your kindom come O God, Your Kindom Come on earth so that earth can be Heaven! Amen. This entry was posted in Home, Progressive Theology, SERMONS, STORIES, Theology and tagged progressive christian sermon, progressive Christian sermon Matthew 20:1-16, progressive christian spirituality, progressive christianity, Workers in the Vineyard by Rev. Dawn Hutchings. Bookmark the permalink.